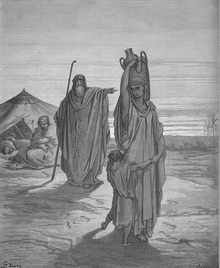 Hagar (Ebreu: הָגָר‬, Hagar, o uncertaint oreegin; Arabic: هاجر‎ Hājar; Laitin: Agar) is a biblical person in the Beuk o Genesis. ↑ John L. Mckenzie (October 1995). The Dictionary Of The Bible. Simon and Schuster. p. 330. ISBN 978-0-684-81913-6. This page wis last eeditit on 3 November 2018, at 17:40.